Also check out our Facebook page for a stream of up to date latest passes! 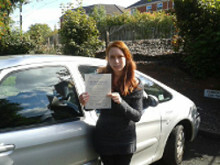 Marie passed her test in the AUTOMATIC with John Grayson in Monmouth, with only 2 MINOR faults!! 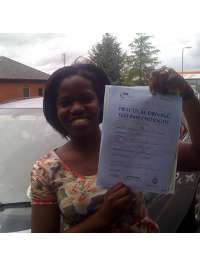 Marie said" Many thanks to John Grayson for getting me through my driving test. I couldn't recommend him more. Even through the tough times he was a great support every step of the way. It's been a hard six weeks but it's worth it'"
John said " I know how much Marie battled with nerves, more than anyone I've seen on test. At times I know she almost gave up, and the nerves were so distracting for her even the examiner said he'd never experienced anything like it in all his 18 years!!" Well at least the test is passed at last!! 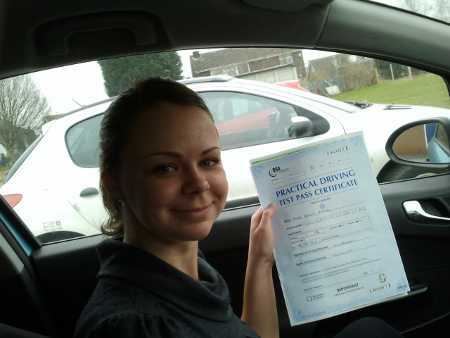 Kirsty passed her test 10 days early, having taken a cancellation in Redditch. 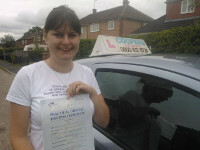 Being at such short notice, her instructor, John Grayson was not available to do the test, but suggested she try in her own car - a rather large Citroen Picasso. With only one lesson in the car the day before test, John was able to help Kirsty adapt the manouevres to the size of her car and she passed with flying colours!! Kirsty said "just want to say a massive thank you to John for everything. He has really helped me become a confident driver. I suffer with Tourettes Syndrome which makes me very anxious and jumpy at times. John put me at ease straight away. I would recommend him to anyone who may be feeling nervous about driving. 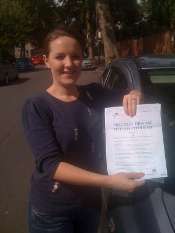 I am so pleased I chose COOPERS DRIVING SCHOOL and am so happy to have passed my test. Thanks again!" Alex Woosnam passed FIRST TIME in the manual car with John Grayson - he said "I couldn't be more pleased'" Alex already has a car thanks to his grandad, so he's well on his way to 'Pass Plus' with John. John said "Alex has been a pleasure to work with, he always approached things in a calm and pleasant way, and picked things up without too much help'" a fantastic result Alex - well done!! Ian passed his test FIRST TIME with Andy Maddocks after only 24 hours tuition. Peter chose AUTOMATIC due to an injury to his left arm following a car accident. The accident left his arm weakened but following a series of operations he feels like the strength in his arm is gradually improving. With the help of a steering ball and adaptation to the indicators which he designed himself, he sailed through the test at GLOUCESTER.. He plans to get an infra-red steering ball when he gets his own car, and this will enable him to do various things such as switch on the lights, and other controls from the touch of a button!! Peter said "I couldn't be happier" ...well nor could we at Coopers. John added, "sounds like you're planning to drive a space ship rather than a car, but whatever you decide to drive, its been a pleasure to work with you, and I'm glad that it will open up work possibilities"
Tom Matus' 2nd test since joining Coopers and again a FIRST TIME pass , this time with Scott in Worcester. Well done again to Tom and well done to both of you!! 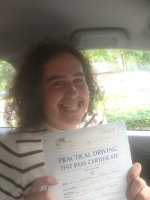 Neil passed FIRST TIME with Bill in Bromsgrove with only 5 minors. Well done to both of you !! FIRST TIME PASS for Richard Stanley and the first pass for one of our new instructors' Tom Matus since joining Coopers Driving School... What's even more amazing is that Richard only took 12 hours tuition!! Richard told us "Thomas was easy to get on with and a great instructor. He helped me get over my bad habits and pass first time. I would highly recommend him to anyone"
FIRST TIME PASS for Andrew Spicer having done an INTENSIVE course with John Grayson. "Thanks for all your hard work..." well YOU did it Andrew. 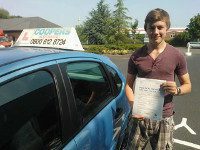 FIRST TIME PASS for Max Hastings-Messenger having done an INTENSIVE course with John Grayson. "I was looking for an Automatic Driving Course that I could take over the space of a week, (INTENSIVE). 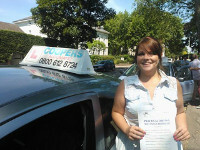 I chose Coopers Driving School because they were a local and reasonably priced company. When I enquired about the course I spoke to John, he was very helpful in trying to fit my course around my lifestyle and making sure I could get the best out of my time with him. During my lessons John was extremely patient and very informative when teaching me, he pointed out where I was going wrong and built my confidence through praise when I got things right. Without Johns guidance and knowledge I wouldn't have been able to have passed my test and I am incredibly thankful to him. Ben Salmon - Passed with Bill Clifford. "John, I would like to say thank you so much for all your help, understanding, and a great deal of patience in helping me to learn to drive. Being able to drive is the best thing I could have ever done in my life after giving up hope for 15 years. I will remember you now and for ever - thank you so much again"
Thankyou so much to John Grayson for his patience and good humour. I passed first time after having failed twice and been taught by a number of different instructors. I feel that his kindness and tolerance coupled with an excellent technical knowledge really made the difference. His instruction was both relaxed and systematic, and the list of complex junctions was just so helpful. I recommend him to everyone without hesitation. Thankyou for teaching me how to drive! Providing me with the skills and the support to pass first time. I would strongly recommend you to any prospective learner drivers, the excellent teaching standard with a friendly atmosphere. So thankyou again, for this life long skill, to which I have already become my little sisters personal taxi driver! Thanks to John Grayson I passed my test first time with only 2 minors. He also helped my husband to pass his test after 3 unsuccessful attempts with another instructor. I would highly recommend John as he takes his time to teach you and he has got a good sense of humour. Having previously had driving lessons with another instructor that completely knocked my confidence John was a very patient, good natured instructor. John not only taught me how to pass my driving test but also how to be a competent and confident driver. I would recommend John to any nervous pupils that need a calm, reassuring approach. Thanks for being a good teacher, I learned very well with you. I felt confident and I thought I was going to pass under your guidance. Thanks again for everything and good luck in the future! We would like to say a massive thanks to John Grayson for all his patience and excellent teaching that led to our son passing his test. He was a very nervous driver who thought that he would never understand gears !! Following an intensive course with John he has passed his test with only one minor fault and now has a real feeling of confidence and achievement. I would recommend Bill to anyone wanting to learn to drive quickly, become confident in driving and test ready! On my first lesson with bill I was nervous and unsure which meant I was often not going above 10mph. could practise them which meant by the time I booked my test I was ready and could do any of the four different manoeuvres. Bill was also supportive with the theory test providing me which questions and answers that we went through on the lesson, and sending me the questions that could be asked on the day off my test. I had a great experience learning to drive with Bill and having passed still carry his card and regularly give it out to anyone who wants a good driving instructor! I would like to recommend Bill Clifford as a driving instructor to anyone willing to learn how to drive, not only to pass the practical test. I had not driven for a year and I was carrying along a number of bad habits, which Bill managed to get rid of with practical examples. He would ask me to switch positions and show me how it is done so that I would gain confidence when doing it myself. Bill is a relaxed and patient instructor, which helped me feel more secure and, in the light of me being a quite nervous guy, it definitely helped me pass the test. I cannot thank him enough for what he did. Many thanks to John Grayson I passed my test 1st time with 2 minors. At 34 and with not much confidence, I felt I would never drive. I decided to book an intensive course and after my first lesson all my nerves went. 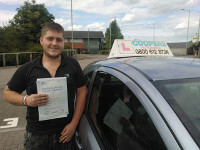 John is a excellent instructer, and I would highly recommend him - I feel confident and safe behind the wheel... Thank you John! Before finding Cooper's driving I hadn't heard about intensive courses, but I am definitely pleased it was recommended to me now! I hadn't been behind the wheel of a car since starting University and within the space of a week I was ready to take my test, and I passed. Definitely recommended to those who've had previous experience or to those who don't have a clue! Adapted to go at your own pace with positive results :) very, very pleased. I'd chosen to take an intevsive driving course in May with Coopers Driving School after having previous lessons last year. My confidence wasnt very good but after having my driving lessons with Bill Clifford my confidence came straight back, Bill was a very easy down to earth instructor who helped me feel comfortable and confident in my driving,my thanks are to Bill helping me pass my test first time, great instructor :-) I highly recommend Coopers Driving School. Natalie Eden (with Bill) in Redditch. I would like to recommend Mark Warr to anybody who is looking to learn to drive. Mark was always on time and was very easy to contact if needed. He gave me confidence when learning and helped settle my nerves before my test. Very friendly and reassuring, I can cleary see that Mark has a passion for teaching people to drive and takes great pide when a pupil passes. 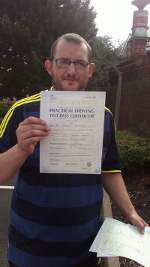 With Mark's excellent teaching I managed to pass first time!! Hi my name is Rick O'Neill. I passed my test today with David Bexton. I would like to pass on my gratitude for the services David provided on behalf of Coopers. I highly reccomend Coopers to any new driver. He maintatined a cool calm approach and was very clear with instruction. He is a very approachable person and any new driver will gain from his instruction and willingness to pass on his knowledge. I have had lessons with another driving school, however my old school did not have a patch on Cooper and imparticularly David Bexton as an instructor. Rick O'Neill (with Dave Bexton), Gloucester. I am very grateful to John Grayson for teaching me how to drive. He has a very calm and professional manner which helped me gain confidence in what can, at times, be a very nerve racking process. He is very friendly with a good sense of humour and I very much enjoyed my lessons with him. 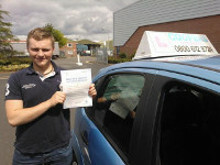 A huge thank you to John for my first time pass and best wishes to him and his pupils in the future." I've just passed my driving test first time and I'd like to recommend my driving instructor Mark Warr. I was very nervous when I started, but he is very patient and understanding and always made me feel at ease. He always showed up on time, covered a lot in the lessons and never cancelled. I would recommend Mark to anyone learning to drive. I have passed my test first time with coopers driving school. My instructor Nathan was great - friendly, consistant and helped me through even though I have some mental health difficulties. The training program was easy to follow and well structured. To celebrate passing my driving test, my instructor nathan challenged me to a go-kart race at worcester go-kart centre, a good way to finish such a really great day. I have already recommended Coopers to my friends who want to learn to drive. Steve Naish (with Nathan) in Worcester. Thank you so much Coopers Driving for helping me to pass my driving test. 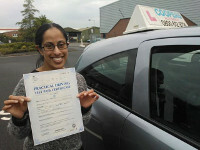 My instructor Bill was excellent, he made learning to drive enjoyable and really helped me to develop my driving skills. I would thoroughly recommend Coopers . Hannah Brown (with Bill Clifford) in Redditch. Over the space of 10 months, I tried various schools and had a total of 4 driving instructors, thankfully I finally found the most patient and calmest one! Over the space of around 6 weeks, I mus'tve taken up all of the time that John Grayson had spare. He helped me build my confidence on the road, and perfect those little "niggly" bits. 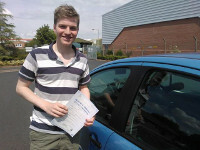 If it weren't for John, I don't think that I would ever have passed my driving test- (especially not first time!). And I thank him because driving is a huge step in the right direction for the rest of my life. Rhianne Cox (with John Grayson), Worcester. I just want to say a HUGE thank you to my instructor John Grayson for getting me through my driving lessons and practical test. I was a very nervous driver when I decided to do an intensive course and then matters were made worse when we had heavy snow fall but thanks to John I managed to do my lessons, theory and practical test in the space of 2 weeks (in the snow!!) 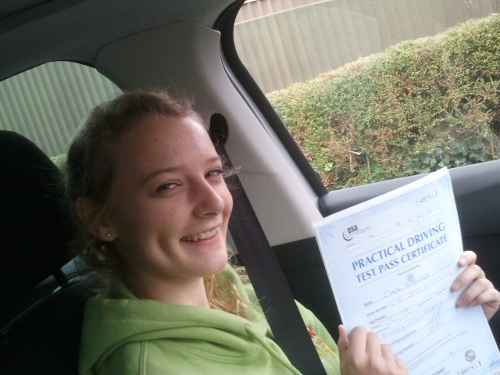 and past 1st time with only 4 minors!!! It was all due to his friendly, understanding (especially when it came to that left reverse!!) and professional approach to teaching and thanks to him I am now independant and have managed to secure a job. I HIGHLY reccomend John to anyone who wants to learn to drive, he got me through it after I put it off for 16 years!! Carmen Malyon (with John Grayson), Kidderminster. Having passed my driving test on my first attempt I would like to thank my instructor, Nathan. From the first lesson he put me at ease. Having never driven before it was rather nerve-wracking, but Nathan helped me relax and to actually enjoy the lessons. I did an intensive course and the hours just flew by. We covered everything that came up in the test so I wasn't left with any nasty surprises on the day. 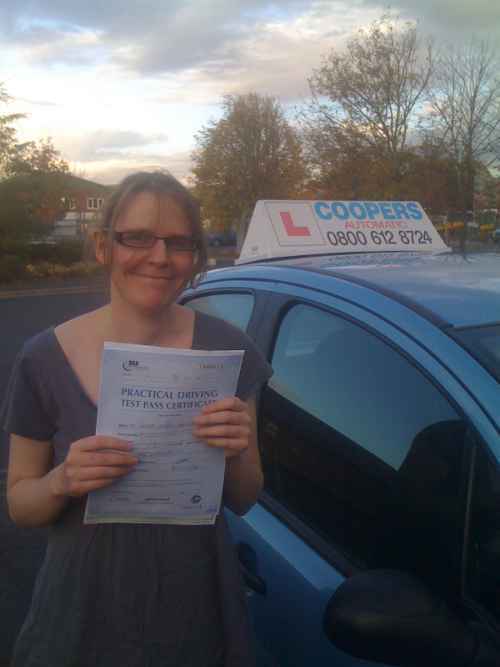 All in all, learning to drive is one of those 'Life' experiences, and Coopers Driving School made it a good one.